The Friday session presents a surprising a variety of toys and objects of interest. 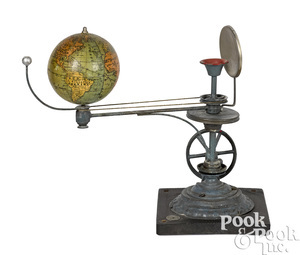 Starting with folk art trade signs from Mort and Francoise Hirschberg, we go on to iron toys from the Bill and Stevie Weart Collection, then miniatures and room boxes from the late Carolyn Sunstein’s collection and her daughter Florence Begun’s charming group of figural tape measures. 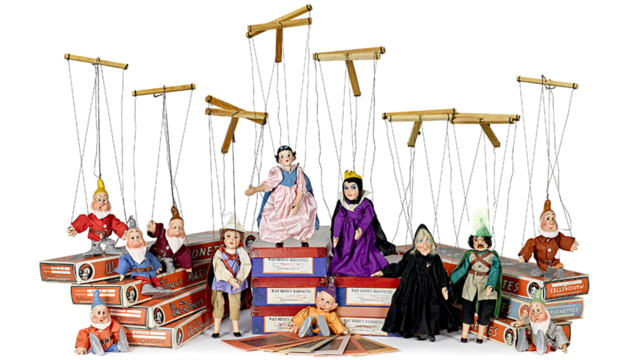 Along the way we have on offer automatons, American clockwork toys and lithographed paper on wood toys and games. The latter grouping is highlighted by, arguably the rarest and most desirable American board games, McLoughlin Brothers masterpiece - Bulls and Bears - The Great Wall Street Game. The Friday session will also offer a number of one-of-a-kind pieces - models made by unsung craftsmen. 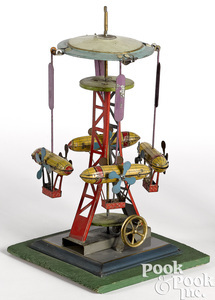 Included are four colorful and nicely detailed circus parade wagons and an impressive wood and tin carousel wind toy formally in the Beernard Barenholtz collection. But stealing the show in the category of unique offerings is a truly extraordinary creation - an exquisitely detailed painted wood model of a Gilded age Pullman Parlor car. The Saturday session of this sale features an astounding collection of steam toys representing the lifelong passion of Morton A. Hirschberg, author of the definitive book on the subject: Steam Toys: A Symphony in Motion (Schiffer, 1996). Never has such an amazing and definitive assemblage of these mechanical marvels been offered to the collecting public. 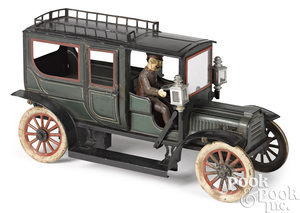 Sharing the billing on Saturday, from a private collector, is an eclectic assemblage of fire fighting toys: ladder and pumper trucks, horse drawn and automotive. Rounding out the day will be tin mechanical and automotive toys, boats and trains from various consignors and countries of origin. ALL TELEPHONE BIDS MUST BE IN BY 4:00 PM ON FRIDAY, DECEMBER 7TH.